We are thrilled to invite you to November Noel, an evening of Fire and Ice at The Broadmoor Hotel on Friday, November 16, 2018. Join us to celebrate the rich history and impact we have made together to help premature babies and their families over the past 45 years. It will be an event to bring together community supporters and friends together, along with the healthcare facilities we continue to serve. 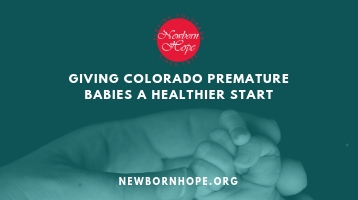 As an event partner of Newborn Hope, you will be recognized among an outstanding group of community supporters coming together for an evening of promise and celebration. Exclusive custom gobo light of family name or logo to project on ballroom walls at the event. Logo recognition throughout mobile bidding platform, including banners and page impressions. To purchase tickets or a sponsorship, click here.